Per the back of the label: "This bourbon was aged for many years in new white oak barrels before spending another two years extracting the subtle, yet sweet flavors from port wine barrels." Per the press release: "Aged for six years in new American white oak barrels before spending another two years maturing inside used port wine barrels. 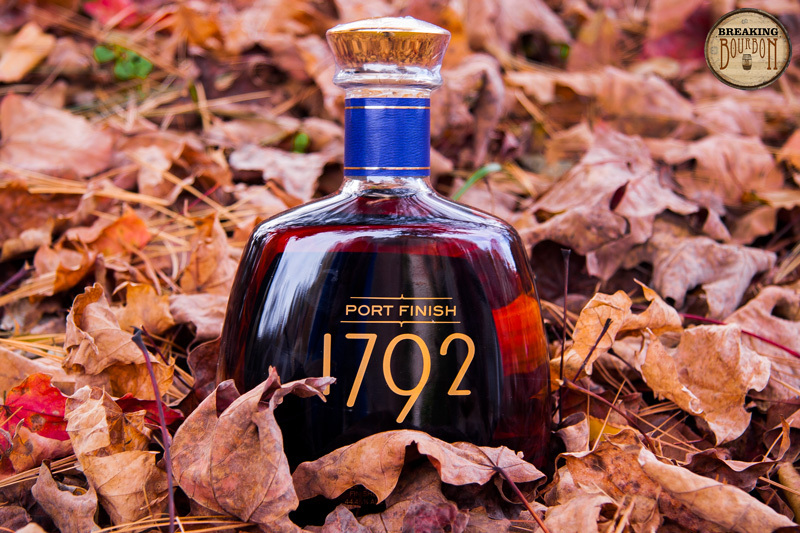 Although this is the first and only batch of 1792 Port Finish Bourbon, the distillery is considering making more. 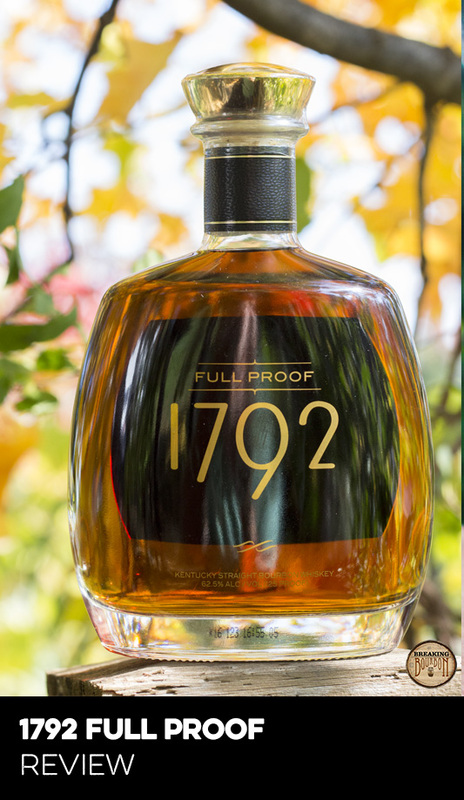 This is Barton’s second release in a series of new expressions of 1792 following the release of the 1792 Sweet Wheat Bourbon. Less floral than I was expecting from a bourbon that was finished for two years in used port barrels. After immediately pouring a glass, I’m treated to hints of light apple, nuts, and charred oak. However, after letting it open up for 10 minutes, the scent profile changes to something quite different. The nuttiness, while slightly noticeable, mellows out and is instead dominated by notes of cinnamon, baking spices, spiced apples, and a faint hint of fresh wood. The nose is pleasant, though I would not guess that this was aged for two years in port barrels based on the scents alone. 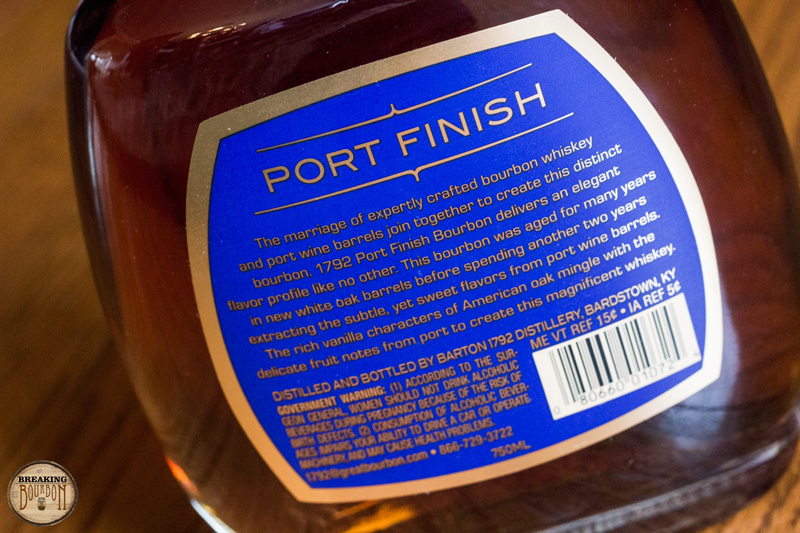 While the nose may lull you into believing that this bourbon wasn’t finished in port barrels for two years, the palate smacks you right back to reality. The time spent in the port barrels is immediately noticeable as it allowed the bourbon to pick up additional flavors from the wood. A nice viscous mouthfeel is present along with flavors of fruit punch, apples, sugar, and a hint of preserved strawberries; reminiscent of a subtle bourbon sangria. It’s sweet without being overpowering, however you still realize that you're drinking a bourbon at all times. Really subtle and enjoyable, and a great change of pace from other recent wine barrel finished bourbons. The nuttiness initially found in the nose reappears in the finish, however not as assertive as before. Instead, it starts more subtle and is mixed together with notes of new oak, caramel, and the preserved strawberries. The finish lingers for some time, with the nuttiness flavor being the main dominant note that carries through. The uniqueness factor on this bourbon needs to be looked at from two fronts. From the barrel finishing standpoint, the uniqueness is off the chart. No other mass produced bourbon has spent two years finished in wine barrels; usually it’s for a much shorter amount of time. It’s really interesting to see what happens after allowing the bourbon to age two additional years in the port barrels after spending six years in new charred oak barrels to start. 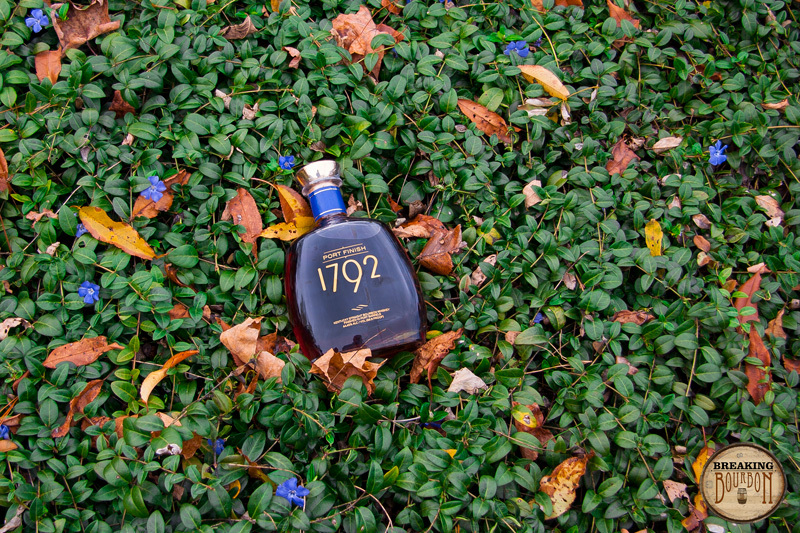 From a flavor perspective, it’s a nice enhancement over the regular 1792. 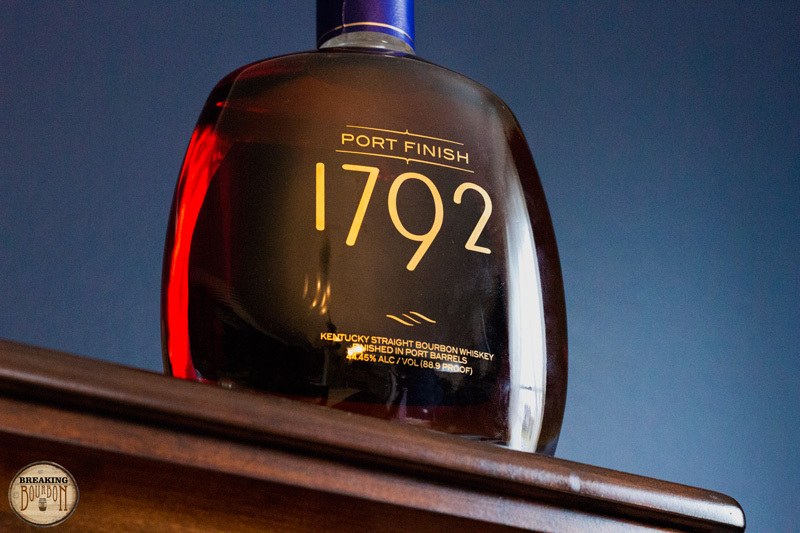 The general nuttiness and base characteristics I find in the standard 1792 still carry over, while the influence of the port barrels is evident without being too overpowering. 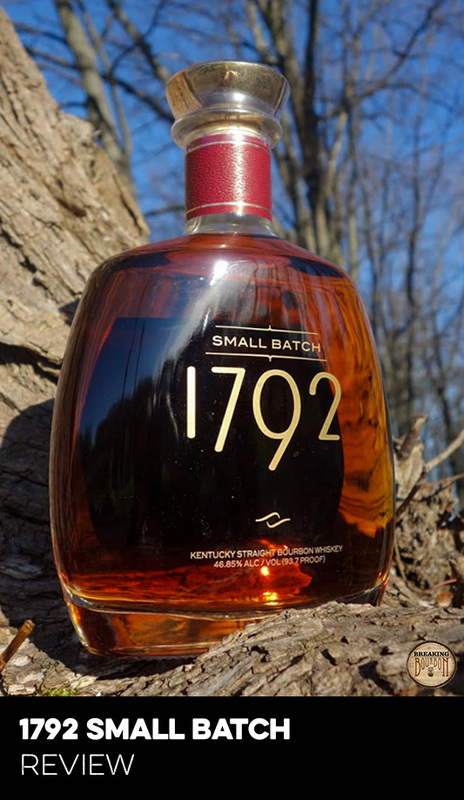 At $40 a bottle, this is a great deal for a barrel finished bourbon, especially one that has spent so much additional time in the barrel finishing stage. The closest barrel finished bourbon in price is Michter's Toasted Oak priced at $50. However, these are two very different finished bourbons to compare in terms of barrels used for the finish, time spent in the finishing phase, and flavor profile. Other companies have done wine barrel finishes including High West A Midwinter Nights Dram and Woodford Reserve 2014 Master’s Collection, however at around $100 each, both bottles retail for two and a half times the price of 1792 Port Finish. 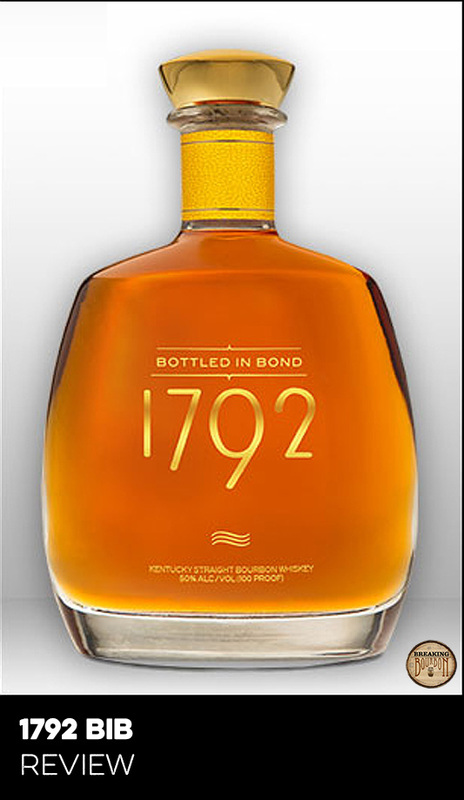 Kudos to Barton 1792 Distillery for bringing a well-balanced barrel finished bourbon to the masses at a very affordable price. For those who haven’t dived into barrel finished bourbons, this is a really good place to start. 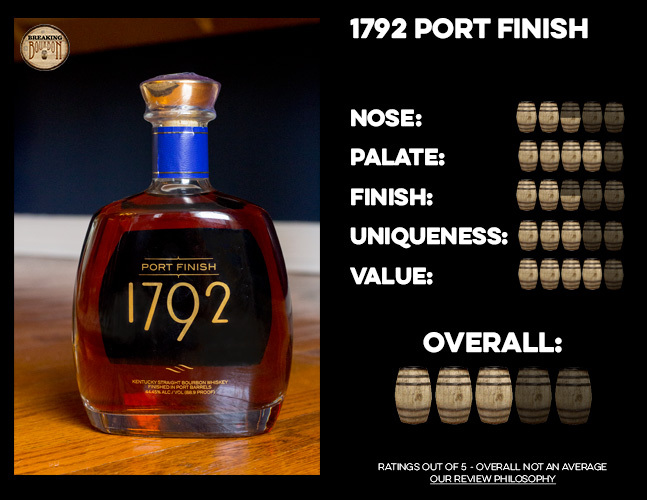 While the key highlight is clearly the palate which is sandwiched between just an average nose and finish, it still has an overall enjoyable flavor profile that is bourbon forward. It’s a nice way to experience the subtle nuances that barrel finishing imparts on a bourbon without having to taste something that is radically different from your standard whiskey profile. Additionally, at $40, you really don’t have much to lose. After experiencing a barrel finish of this length, at this low of a cost, I hope other distillers follow suit and offer barrel finished bourbons at a similar low price point.